I was cordially invited to participate with other members of the fantasy community in a 12-team PPR mock draft. In this 12-round draft, we start the following: QB-1, RB-2, WR-3, TE-1, FLEX (RB-WR-TE)-1, K-1, and Defense-1. I was granted the 12th pick in this draft. Drafting at the turn is a potential handicap. With 22 picks between draft picks, I am left vulnerable to position runs but also have the fortunate advantage of possibly creating position runs as well. I was also forced to take risks because the talent drop-off that occurs between my picks. In PPR leagues, receivers dominate scoring and in this league, we can start four receivers. Targets and receptions are very valuable in PPR leagues, especially with running backs. My focus was to take four receivers and pass-catching running backs, this strategy also required me to load up on speculative running backs in the later rounds. I was tasked with either going for two top-10 running backs in Melvin Gordon and/or Leonard Fournette or take top-5 wide receivers. While the running back position is very top-heavy with supreme talent, my decision was to go with both wide receivers. In a PPR format, where we could start up to four receivers, getting two of the top five receivers seems like a no-brainer. Julio Jones is a sure-fire bet to give me 80+ catches and 1400+yards. If he can ever score touchdowns, he would rank as the number one receiver. Michael Thomas is a target hog who has averaged 98 catches in his first two seasons. While he did take a step back with touchdowns with only five last season, he is primed for positive touchdown regression as Drew Brees‘ main target. As I mentioned earlier, the amount of players taken between picks leaves me praying that my targeted players slip to me. Unfortunately, my targeted players Jerick McKinnon and T.Y. Hilton were taken a few picks ahead of me. Rookie Derrius Guice was primed to take over as the Redskins starting tailback in 2018. His off-field incidents hurt his draft status and the Redskins benefited. Guice looked to be the second best rookie running back behind Saqoun Barkley, and was one of the few running backs remaining in a workhorse role. Unfortunately, as we found out this weekend that Guice suffered a torn ACL and will be out for the season. Terrible news for the young talented running back and the Redskins. The Redskins are now left scrambling to replace Guice with a group of running backs who are average-at-best. With my next pick, I decided to roll with WR Amari Cooper. I felt at this juncture in the draft and the current status of my roster, Cooper would be a great third WR. New head coach Jon Gruden is looking to build the offense around Cooper, who really hasn’t lived up to expectations so far in his career. Cooper claims that he played with a foot injury all of last season, which would contribute to his poor showing. Cooper has top-1o upside in this offense especially with the Raiders not having Michael Crabtree on the other side taking away all of the red-zone targets. Staying focused on starting four receivers, I grabbed the highest ranked WR on the board in Corey Davis from the Tenessee Titans. Corey Davis is on almost everyone’s breakout list coming into this season. The last time we saw Davis play, he scored twice against the Patriots in their playoff game. Hoping that provides the confidence to reach the upside of a WR1 with the Titans and a wonderful flex play on my team. I have to admit that I am really not too happy with my next selection, Colts RB Marlon Mack. I reached for Mack in the attempt to secure a running back. However, Mack has yet to prove much of anything so far in his time with the Colts. With Andrew Luck now back at the helm, that might open up the offense. However, Mack is a JAG who will have to battle two rookie running backs for playing time in the Colts backfield. I probably should have selected either Broncos RB Royce Freeman, Seahawks RB Rashaad Penny or even Patriots RB Sony Michel for the upside. 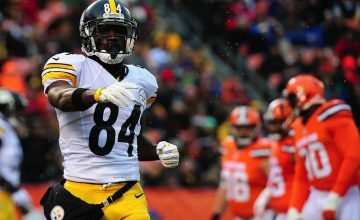 With my focus on wide receivers, I have to select multiple speculative running backs and hope I can play matchups or I hit the jackpot with one of them. My next selection, I chose Raiders RB Marshawn Lynch. Lynch actually produced as a top-10 running back at the end of last season. He finished with almost 900 yards rushing and seven touchdowns last season. He was a pleasant surprise and owners who grabbed him were rewarded immensely. This season could be a different story. The Raiders signed veteran RB Doug Martin in the off-season. While Martin was nothing special last season, he might eat up some of Lynch’s touches which will obviously limit Lynch’s upside as a volume-based running back. I went back to the wide receiver pool with my next selection, Giants WR Sterling Shepard. A nagging ankle injury forced Shepard to miss five games and bothered him all of last season. Shepard still led the Giants with 731 receiving yards and finished with 59 catches. He was the focal point of every defense with Odell Beckham, Jr. out for the season and still produced good numbers and big plays. He had three receptions of 40+yards. 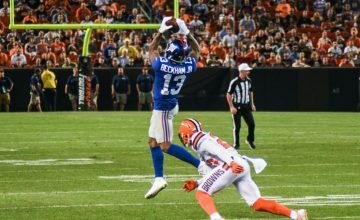 With Beckham now back and the addition of rookie sensation Saquon Barkley, the emergence of impressive tight end Evan Engram, the Giants have tons of weapons for defenses to worry about. I am looking for Shepard to break out this season to the tune of 1,000+ yards and seven-nine touchdowns. The old adage of waiting on quarterbacks is alive and well. 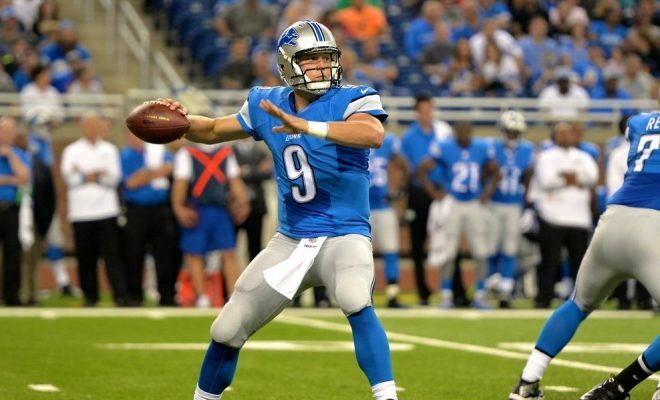 Grabbing Matthew Stafford in the ninth round is a no-brainer pick. He has been a top-10 quarterback in each of his last three seasons. 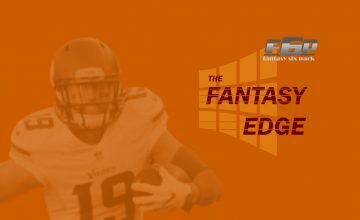 Draft to fill out your running backs and wide receivers first then grab one of the still available elite quarterbacks is a winning formula in fantasy football. To fill my TE position, I selected Bengals TE Tyler Eifert. All fantasy owners know the story on Eifert. He is a TD-machine when he is on the field. The issue is that he has missed 22 of his last 32 games. With the elite tight ends off the draft board, it is a roll of the dice on the remaining tight ends. IF Eifert stays on the field, I have a TE who potentially will provide 10+ touchdowns. If he gets hurt again, I move on from him and grab a TE off the waiver wire. The lost draft capital is negligible at this point of the draft. Fantasy owners should already know that you pick your defense and kicker with the last two picks of the draft. I just happened to select the top ranking ones at each position although some of that was due to my confusion on the roster spots. After a review of my roster, I would give myself a C+. Not my best work. 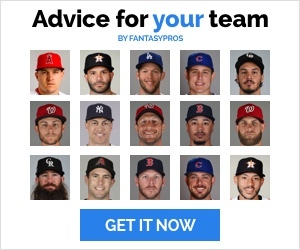 However, I think in a draft with full rosters, my strategy would have worked a lot better. My focus on receivers led me to have a great starting receiver core with an upside flex. It also resulted in me having a weak RB core. In a full draft, I would have gone deeper in the running back pool and selected speculative running backs with hopes that I would hit the jackpot. Backs like Chris Carson, Peyton Barber, and I would have hand-cuffed Darius Guice. With the improvement at the running back position, I truly believe I would have challenged for a playoff spot with this roster. What do you think?